"There is one day that is ours. Thanksgiving Day is the one that is purely American." It's only been in the last couple of years, since my friends Stephanie and Michael moved to Colorado, that I have begun making Thanksgiving dinner again. For many years, Stephanie and Michael hosted friends and family at their house. Every year I'd contribute the desserts, and I was more than happy to take on the baking responsibilities. My daughter, Maddie and I would spend Wednesday, the day before Thanksgiving, baking pies, fruit tarts, crostatas, pecan tassies and cookies. Pumpkin pies were always a fixture, of course. But we'd mix up the other desserts based upon what we felt inspired to bake. After a huge midday meal of turkey and all the fixings, Stephanie and Michael would pull out games and we'd play Trivial Pursuit (usually women vs. men), Apples-to-Apples, or Liar's Dice. The big group would sit around the table, talking, laughing, joking, with a lot of good natured ribbing being exchanged between us all. In the early evening, we'd dig into dessert and leftovers were divided up so everyone could spurge again the next day. Those are wonderful memories, and I miss our days and evenings shared together, especially around the holidays when we'd gather for Halloween parties, Thanksgiving, Christmas and New Years. When Stephanie and Michael pulled-up stakes and moved, the task returned to me to pull together a Thanksgiving dinner for my family. 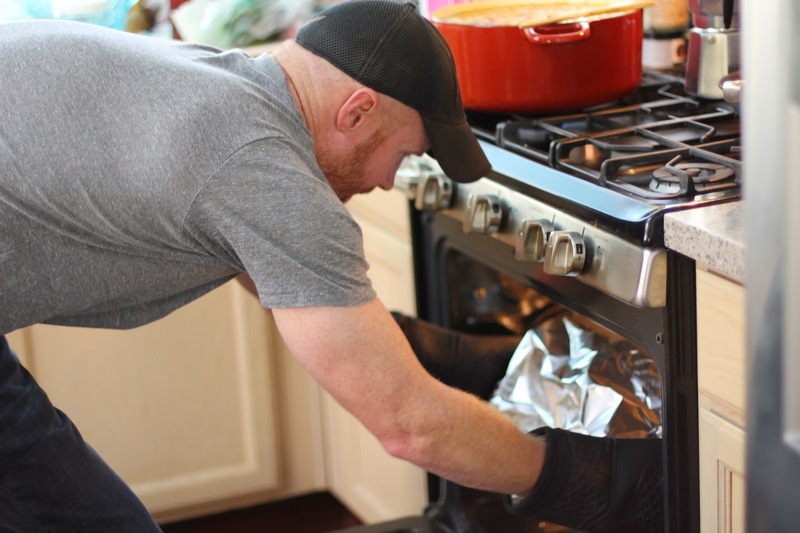 Thanksgiving takes a lot of prep, and a good plan, but I don't particularly think of it as a difficult meal, especially if there is one or two additional sets of hands that pitch in and help cook and clean. Every year I buy all the food magazines searching for inspiration. I don't know why I bother because like most families, everyone wants the same meal year after year. I still enjoy seeing an Asian spin on the holiday meal though, or how the folks in Louisiana are adding Cajun spices and oysters to the stuffing. I think I'll add a new side dish, but it always seems that the menu is practically carved in stone by our family tradition. Last year was particularly special because my sister Linda, and her son, Jordan were able to come to Arizona for Thanksgiving. 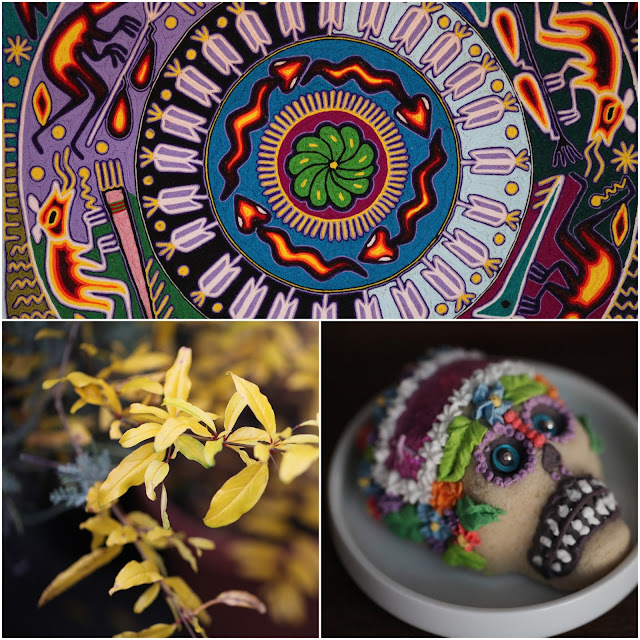 If you are a frequent reader of the blog, you probably know that Linda is a manager at Whole Foods. When your career is in retail, especially a grocery store, the holidays are the busiest time of the year. Grocery employees simply do not get time off between Thanksgiving and New Year's Day. Linda had sustained a work injury in the fall and for the first time in many years she was able take the time off and be with us for Thanksgiving. So, then, here's what happens when our family gets together. And, I'm sure we are not unique. Perhaps you can relate. 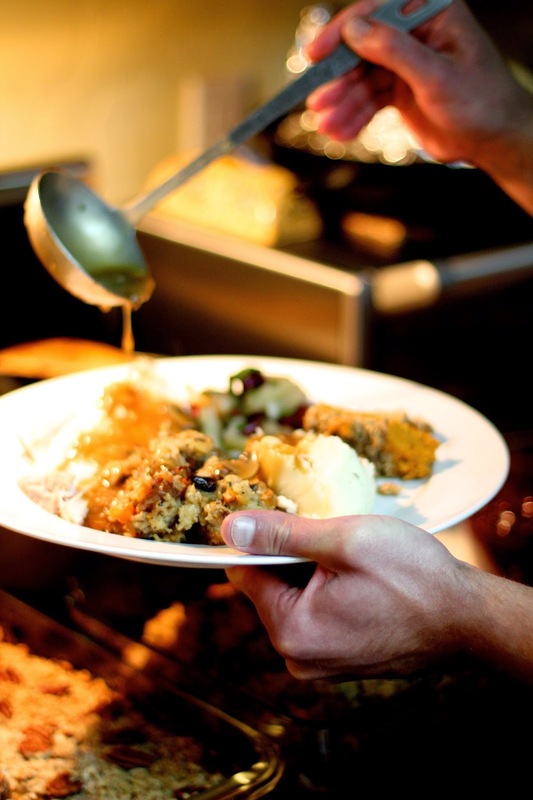 Practically everyone has an opinion about how the dishes should be made, what kind of turkey should be served, and how to eat dessert. That's why God made wine I've decided. One of the bigger debates last year involved stuffing the turkey. Due to well established food safety rules, cooking professionals pretty much agree that turkeys should not be stuffed. The dressing is simply heated in its own container. Linda and I were in complete agreement on how the stuffing would be prepped and heated. When Mom heard this news, it just about sent her over the edge. Her happy Thanksgiving dreams were quickly turning into a holiday dinner nightmare. What proceeded was a long, somewhat heated exchange between we three about the damn turkey and the damn dressing. It was two sisters against one Mother, but Mom won in the end. The turkey was stuffed. Nobody died. Everyone managed, in fact, to end the day on a very positive note. 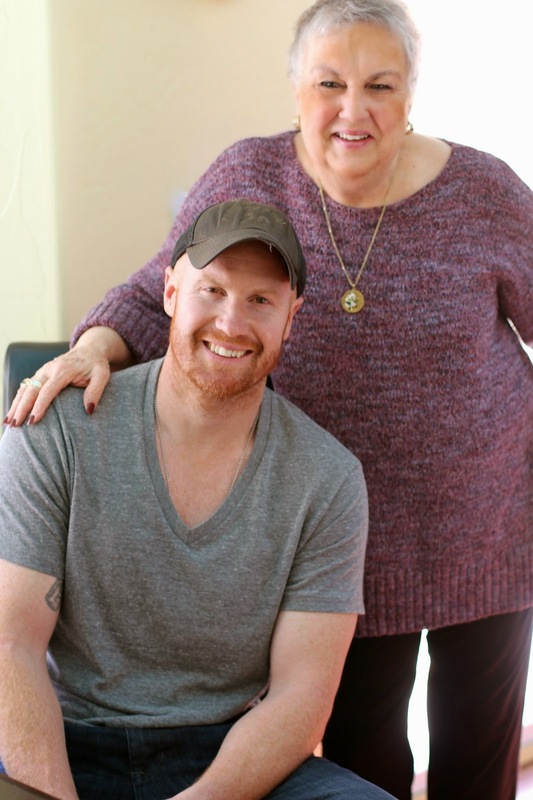 Our Mother poses with her grandson, Jordan. I did find out just recently that my niece Avalon was quite disappointed that we didn't serve molded red Jello with berries last year for Thanksgiving. This is a dish that Juliette made every year, and the girls grew up on it and fondly refer to as, "White Trash Jello". On the other hand, Mom was quite happy that we made Cranberry Fluff after having it out of the Thanksgiving menu rotation for so many years. With a large group, in particular family, it's hard to make everyone happy. But we sure try. And we love everybody just the same in the end. P.S. : My daughter, Maddie is away at college. She is regularly enduring cafeteria food during her first semester in college. When I asked her recently what she cared about most for the upcoming Thanksgiving glutton fest, she listed off her favorite dishes in the following order: pumpkin pie, apple pie, turkey, mashed potatoes, mushroom gravy, and stuffing. Everything else on the table is just a bonus. Of course, I purchased the largest all-natural turkey I could find, which weighed nearly 26 pounds. For the best, most tasty bird, brining is the way to go to pump up the flavor. Brining takes time, but fortunately it's a minimal investment of actual hands-on time, and the easy process produces exceptional results. Plan on brining one hour for every pound of turkey, so plan accordingly. For my big bird, this meant 26 hours, plus additional time to make and cool the brine. 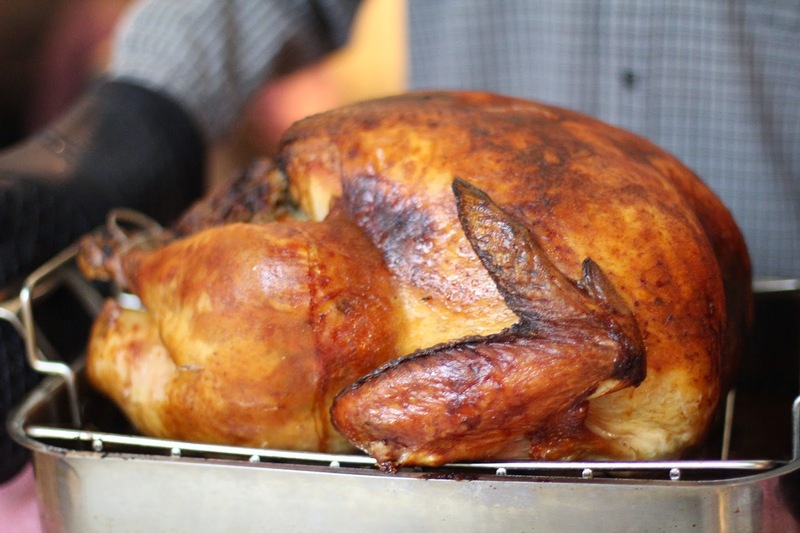 A turkey that roasts in an oven at 325°F, will take approximately 20 minutes per pound to turn out moist and delicious. My big bird took about 8-1/2 hours to roast. 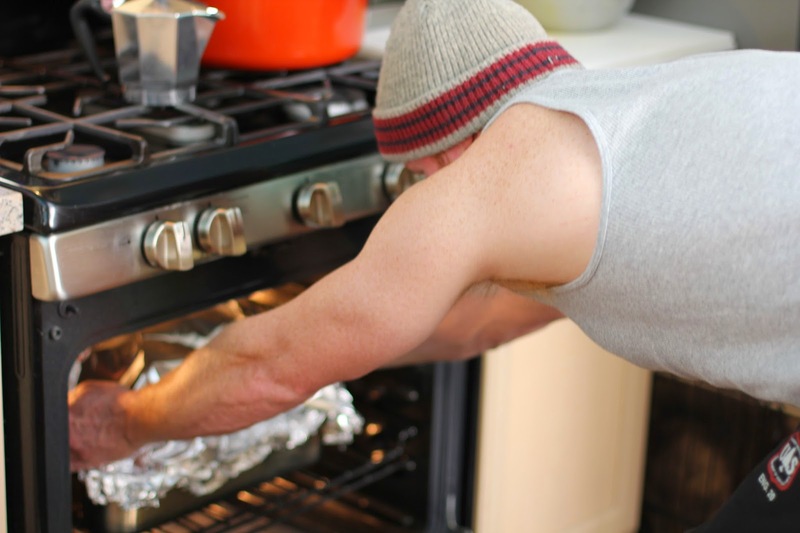 If you plan on stuffing the turkey, the stuffing must be made a day ahead and be very cold. Take the cold stuffing and loosely pack it into the bird's cavity right before you plan on putting the turkey in the oven. Also make sure there is an air space between the stuffing and the ribs because the stuffing will expand as the turkey roasts and the stuffing absorbs the drippings, making it ever so delicious— Mom's favorite. Linda's son, Jordan, places the huge bird in the oven. the position in the oven every couple of hours. to pull your Thanksgiving turkey out of the oven. one pair silicone kitchen mitts - I love these!!! 1. Make the brine: In a stock pan, combine the salt, sugar, water and sliced lemon. Heat, stirring occasionally, over medium heat, until the salt and sugar have dissolved. Remove from heat and let cool to room temperature. 2. Unwrap the fresh or thawed turkey. Remove giblets and keep for making gravy, if needed. Place the turkey breast side up in a large kitchen bag, such as a thick white trash bag. Transfer the bagged turkey to an ice chest. Pour in the brine and the buttermilk. Gather the bag up around the turkey, tight enough so the brine encases the turkey. Expel excess air and tie a knot at the top. Add ice to cover the turkey. Close the lid and store the cooler in an area that is cool and shaded. The turkey needs to stay at or below 40°F. Add additional ice, if needed. Let the turkey rest in the brine for 24 hours. As I mentioned above, a foil-covered turkey will take about 20 minutes per pound to roast in a 325°F oven. I always buy the largest turkey I can find, which ranges between 24 to 26 pounds. A 24 pound turkey will take about 7-1/2 hours to roast. If you are planning on disappointing my Mother by not stuffing the turkey with dressing, then loosely place chopped celery and carrots in the cavity. If you are feeling adventurous, you can also add some herbs, such as rosemary, thyme and sage, and perhaps even a couple of garlic cloves. 1. 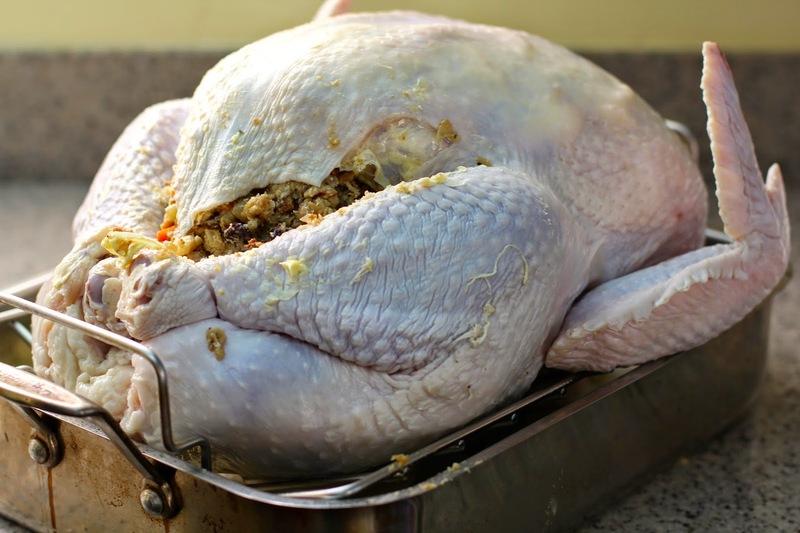 Remove turkey from the brine and transfer to kitchen sink. Rinse the turkey well. 2. Place the oven rack in the lower third of the oven. Preheat oven to 325°F. 3. Grease the bottom and sides of an extra large roasting pan. Place 1/4-inch round slices of onion along the bottom of the pan. Add 2 cups of white wine. Grease the roasting rack and place in the roasting pan. 4. Place the turkey breast side up on the rack. 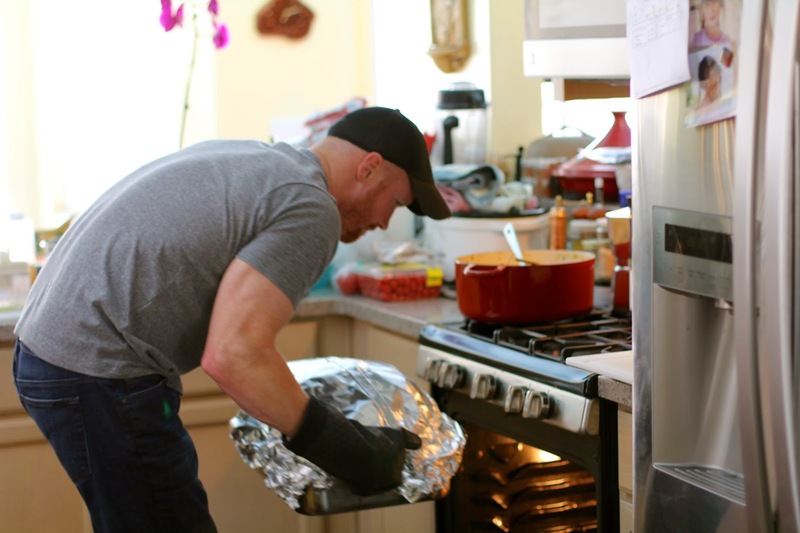 With paper towels or a kitchen cloth, pat the turkey dry inside and out. 5. Using your forefinger, gently separate the layer of skin from the breasts, creating two pockets. Generously smear room temperature unsalted butter directly onto the breasts, about 1 stick, or 8 tablespoons. 6. In a small bowl, combine the sweet paprika and olive oil and stir until smooth. Rub the seasoned oil all over the outside of the bird. 7. If you plan on stuffing the turkey, the stuffing must be very cold. Don't take it out of the refrigerator until you are ready to stuff the turkey. Lightly pack the stuffing in the cavity making sure to leave an air pocket at the top because the stuffing will expand as it bakes. 8. 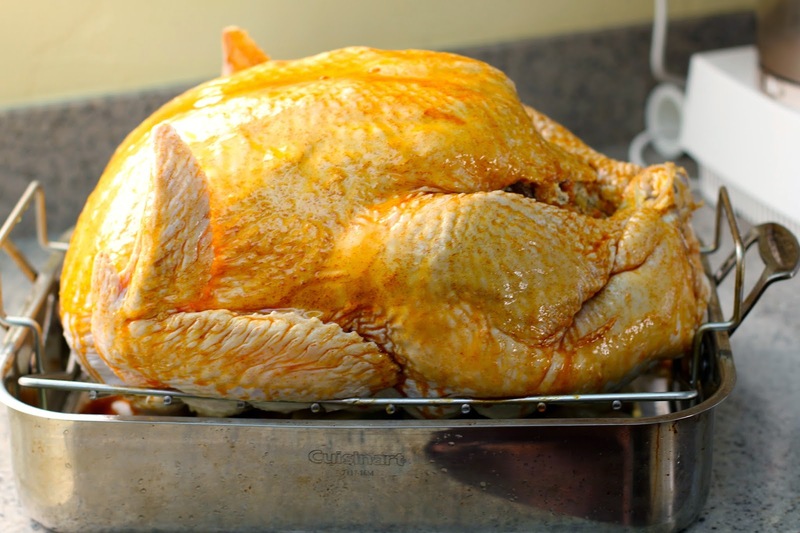 Cover turkey loosely with aluminium foil, making sure to leave an air space between the bird and the foil. Tuck in the sides near the neck and drumsticks. 9. Place the turkey into the oven and turn the pan 90 degrees every 2 hours for even roasting. 10. Continue to roast the turkey covered with the aluminum foil, until about the last hour, then remove the foil so the turkey can turn a gorgeous deep hued brown. 11. 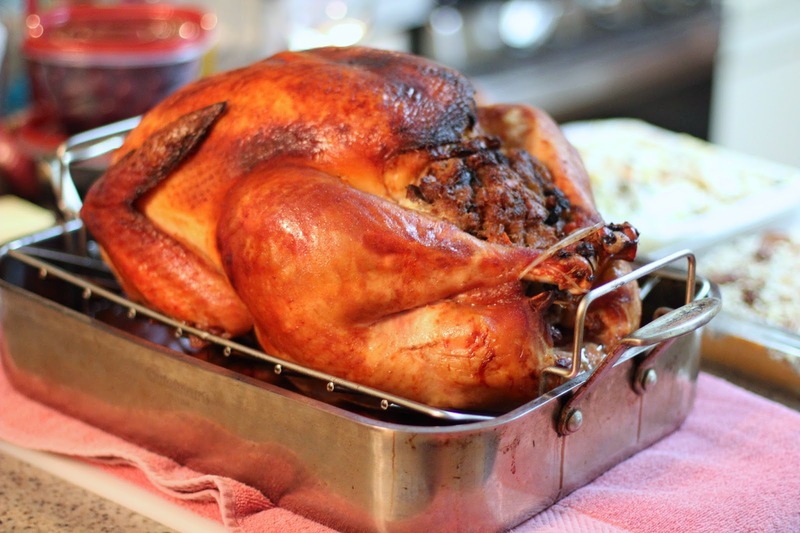 A turkey is done when a meat thermometer inserted in the thigh registers 185°F. 12. 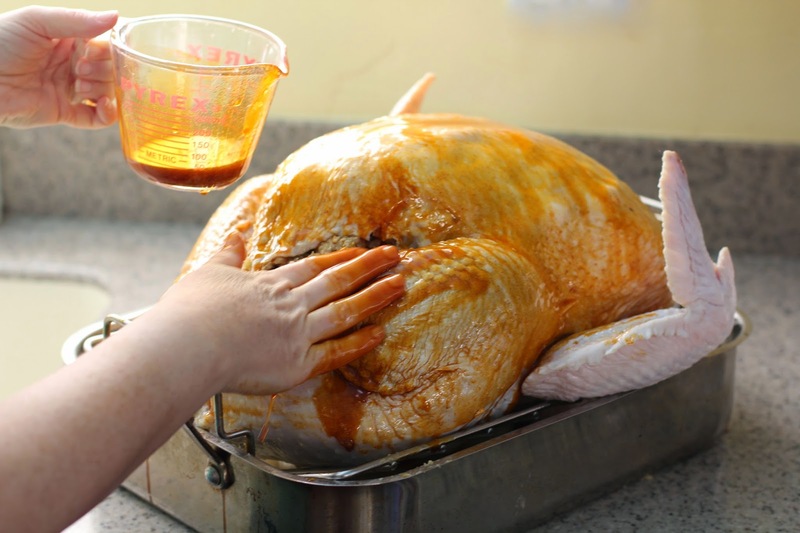 With heavy duty kitchen mitts (such as Silicone to protect your hands), tightly grip the handles of the hot roasting rack and transfer the turkey to a cookie tray. Let the turkey rest. 13. Remove solids from pan drippings and discard. Pour the reserved drippings into a gravy separator. Use the pan juices to make gravy. 14. Allow the turkey to rest at room temperature for about 45 minutes to an hour before carving. The resting part is an important step, so don't skip it. Plus, you need time make gravy or finish the mashed potatoes. 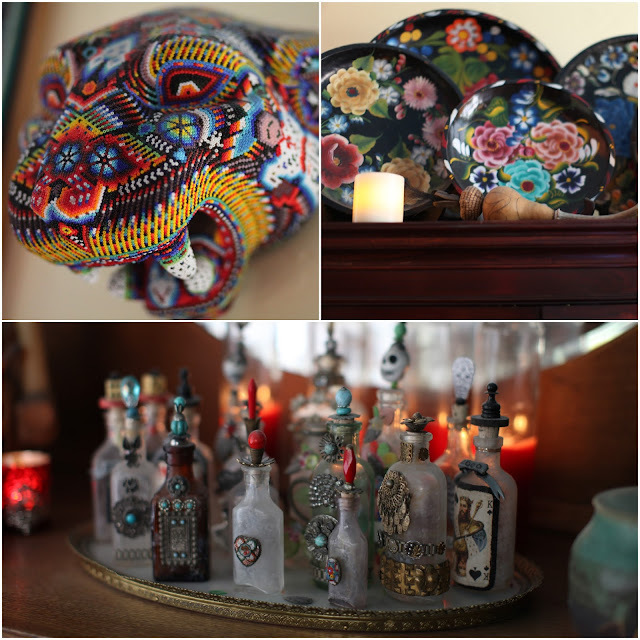 Have a skilled person carve the turkey and place the pieces artistically on a beautiful platter.